“Whaat? !” Toxie? 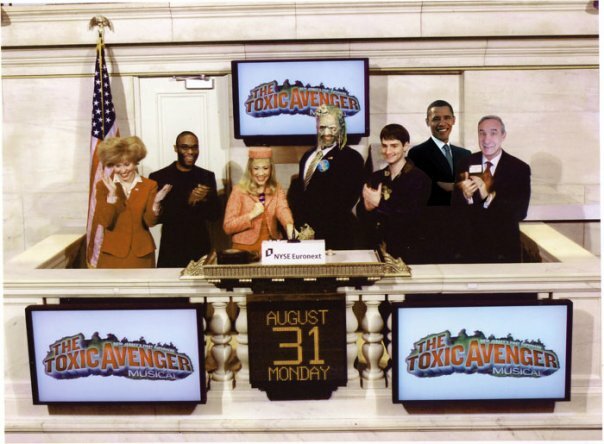 Our very own Toxic Avenger would be ringing the bell on the New York Stock Exchange? The Global financial center of THE WORLD? We’re talking WALL STREET people, dominated by cigar smoking rich men in business suits, suspenders and shiny loafers carrying matching briefcases. This is not the kind of place that calls up the Toxic Avenger and asks him to ring the opening bell. This was monumental. “Get down here by 7am! and I think I can get you in with us!” I hung up the phone and jumped out of bed. Fortunately, I wasn’t very far. In fact, I lived right upstairs, yes dear readers, I lived at home. I threw on a Toxic Green Dress and raced downstairs. As I reached for a bagel presented on the silver platter in front of me, I looked around the NYSE boardroom breakfast table: there was Dad wearing a nice suit, and a bowtie, and of course his saddle shoes. To his right sat his creation, THE TOXIC AVENGER, green, slimy, dripping, but wearing a jacket and tie. To his left was the Mayor of Tromaville, her bright red suit, crazy hair… I am quite sure no Subhumanoid monster had sat at this board table for meetings or fancy breakfasts before. As we walked through the floor, traders stopped and turned to cheer. Those who were in our direct path high fived Toxie, some ran over to shake his hand. I was so proud of my Dad, this was really cool. He had created the Toxic Avenger, and today, this morning, his creation was being recognized and honored by something as world renown as the New York Stock Exchange! This is a top Tromemory.